Peter and Carolyn Farquhar live in a semi-detached Edwardian house in a tree-lined avenue in West London; they became Hosts seven years ago. “We have one double bedroom available for most of the year and, when the children are away at school, another two. “It’s the diversity of guests that makes hosting such a lot of fun. We have people from all over the world, including South Africa and Australia, although I must say Japanese guests are absolutely immaculate in the way they leave their rooms. “In the early days of becoming Hosts my wife had to go away, so I was left for the first time as a lone Host. Wanting to prove I could cope, I made an extra effort, that even included ironing the bed linen – and I hadn’t done any ironing since my National Service days. 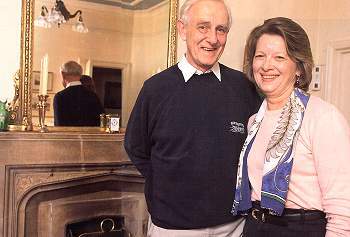 “The couple I had were marvellous at helping me, by doing things like bringing the breakfast dishes into the kitchen, so I invited them out to dinner on their last night and ended up spending most of the profits! “Guests are interesting in their breakfast habits. I like to cook a full English breakfast and, in the past, I’ve converted some guests away from their muesli into bad ways. “A few years ago we had an American woman from San Francisco, who turned out to be an FBI agent over in London for a course. Our sons were agog and asked to see her gun, but they were disappointed as she explained she had to temporarily surrender it to the airport during her stay. “We’ve only ever had trouble with two couples out of what must be several hundred who have stayed with us. “Wanting to be a host attracts a certain type of personality and those who like to be a paying guest attracts another type of person. In the vast majority of cases it’s a very happy marriage”.